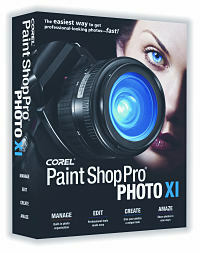 Corel have released a new version of Paint Shop Pro, now known as Corel Paint Shop Pro Photo XI. The name of the program gets longer with each release and also so does the amount of space it takes up on your hard drive. 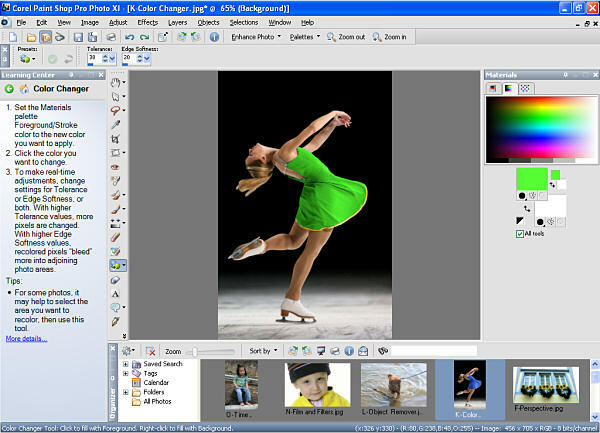 Along with the program comes a 30-day preview of Corel Snapfire Plus, which offers image editing, photo-management and creative photo-project tools. After the trial period, the standard features are still available, but I'll come to this program later in the review. There are a number of new features in the main program, and improvements based on user input. If you have many photos on your hard drive, it's difficult to keep track of them, so the new Organiser management centre takes the guesswork out of finding images. You can search by filename, date, type or folder location. You can assign keywords and ratings to the pictures, which are shown in a thumbnail view and you can edit the EXIF-data (that's the data about the photo added by your digital camera). You can also extra frames from video files to make it easier to organise them. Corel are trying to incorporate features seen in other programs, as I usually use PowerDVD or a video editor to extract frames from video files, and ACDSee to manage my images. If you do have many images on your system, you probably already organise them into folders. If you want to add keywords to them using Corel's organiser, then it's going to take you a long time if you have many pictures. The Crop Tool has changed in response to user feedback (apparently) to give users the exact dimensions they want in a snap. Instead of entering the dimensions, which you can still do, when an area is selected with the crop tool a floating toolbar appears below the area, allowing the user to choose a predefined crop size or rotate the area. As great as it may be, I found the toolbar got in the way, and would have preferred it to be with the rest of the crop tool controls. Some of the dialogs for tweaking your images have been enhanced, including the levels and curves dialogs. Histograms are now included, and the preview rendering is improved. Rather strange with most of the dialogs is that the preview in image option has been moved to the top of the dialog as a tick box instead of a button underneath the preview image. With some effects it's difficult to see how it will change the image in a small preview, so seeing the effect (no pun intended) applied to the image itself can help you adjust the controls to get the required result. The Colour Changing tool lets you change the colour of an object in the image, like the colour of a person's shirt, for example. You need to make a selection to avoid the effect leaking onto other parts of the picture, but you can choose the edge softness of the selection. You then just pick a colour and click on the object in the image to change its colour, taking into effect the right brightness and shadow elements. Before this tool, you needed to select an area (or with me create a layer) and colourise it, possibly tweaking the saturation and contrast levels to the desired effect. It can work wonders on an image, but really depends on the contrast and levels of the image you are working on, so it can be a bit of a hit or miss. A Depth of Field effect allows you to blur the background of an image, but even with the variety of the selection types, it's really just a selection tool that blurs. Skin Smoothing has only an amount control but it can reduce the wrinkles in a person's skin. Along with the tanning, teeth whiten and spot remover you can really go to town changing a person's appearance. There are some new special effects that can be applied to an image. Time Machine lets you choose from seven different effects to age your picture, namely Daguerreotype (used in the 1830s), Albumen (used from 1850), Cyanotype (used in 1840), Platinum (used in 1870s), Box Camera (popular from 1900s), Early Colour and Cross Process. There are new Film and Filters, such as Vivid, Vivid Skin Tones, Muted Reds, Enhanced Reds, Vibrant Foliage, Warm Earth Tones, Glamour, Night Effect, Cooling, Warming, Orange, Champagne, Sunset and Custom. Corel Snapfire is a separate program that seems to duplicate many of the features in Paint Shop Pro. The Photo Doctor analyses the image and recommends when a Quick Fix should be applied, as well as Red Eye, Crop or rotate. You can also choose to open the image in Paint Shop Pro where you can do all of these fixes as well. Photos projects allow you to produce calendars, collages, greeting cards and print layouts, the latter of which you can do in the main program. Photo Downloader automatically downloads photos from card readers or cameras, and can be set to work with no user intervention. It can also detect Photo CDs, but for all this to work seamlessly, the program must be loaded when the computer starts up. As I haven't bought a digital camera for a while I can't tell whether this feature is available with the normal driver software, but it certainly is with my Kodak DX3900 digital camera, and Windows XP certain runs an auto play feature when I plug in a card into my card reader. Quick Review lets you manage slide shows, adding captions, ratings, rotate images or apply a quick fix to a slide. 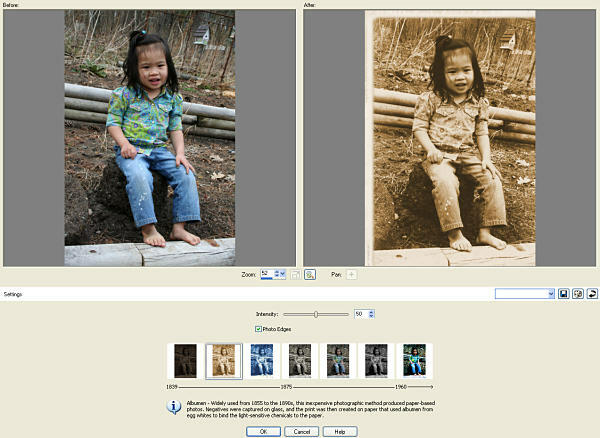 Photo Trays lets users gather photos from various folders so you can then e-mail, print or upload the images. E-mailing pictures is enhanced so previews can been seen before sending the pictures, which can be sent as attachments or an embedded photo. 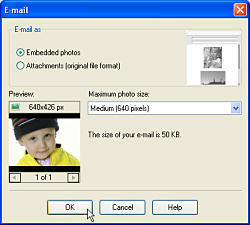 A maximum photo size can be set for the images and the file size is given. In these days of broadband this is becoming less important, but not everyone has a fast internet connection speed. The differences between the previous version of Paint Shop Pro and this new one are not that much, so I wouldn't really upgrade. However, if you've never had a graphics program then this version will let you do everything that you want. If you don't have anything to organise your photos, then this program will help you and if you want to grab frames from video files then you won't need another program to do that. If it could only edit icon files, then this would be the one program for all my graphic needs.